Record levels of activity and growth of insurance-linked securities (ILS), catastrophe bonds and collateralised reinsurance continues to put a strain on reinsurance pricing and some reinsurers are only remaining profitable thanks to low levels of major loss and reliance on reserve releases, according to Fitch Ratings. The rating agency continues its focus on the big-four European reinsurance firms today, taking a look at what has sustained their profitability despite the pressurised state of the market and it looks like some are pushing the limits of their ability to avoid falling into the red. Lower-than-expected levels of large losses in the first-half of 2017 have helped these reinsurance giants to maintain underwriting profitability, Fitch says. Additionally, their ability to continue augmenting their quarterly performance with releases from prior year reserves has buoyed their results keeping them in the green. So reinsurers are, to a degree, surviving thanks to the below average loss experience of recent years and their reserve releases, but the gap to breakeven has been shrinking and beneath the hood some look less profitable than others, Fitch explains. We asked yesterday, how long can little better than break-even be sustained? Fitch suggests today that it will not take too much to tip at least some reinsurers into the red. 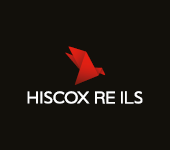 “On a normalised basis, adjusting for variances from budgeted totals for major losses and prior year reserve development, the combined ratio for both Munich Reinsurance Company (Munich Re) and Hannover Rueck SE (Hannover Re) was above 100% in 1H17,” Fitch Ratings explains. Swiss Re would have been very close to an underwriting loss at a 99.6% combined ratio, while SCOR would have fared best at 94.7%, Fitch’s data shows. This shows that had the industry faced a series of larger losses in the first-half and had reserve development been in line with forecasts, these two reinsurers would have made underwriting losses for the period. The increased combined ratios these reinsurers have been reporting year-on-year, despite the lower levels of losses, is a manifestation of the soft reinsurance market and pressured pricing. 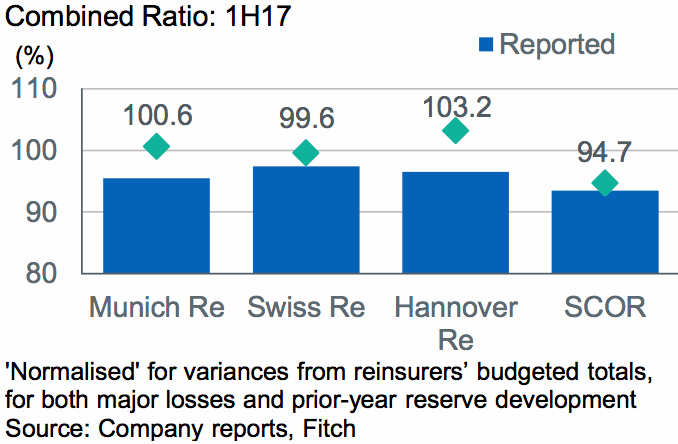 Fitch notes that of the big four reinsurers the startegy is diverging in terms of P&C reinsurance underwriting, given the continued pressure on pricing, with Munich Re and Swiss Re pulling back, while Hannover Re and SCOR expanded in the first-half. At the same time all four have reported continued portfolio-level rate reductions, although at a slower rate than in 2016, showing that pricing clearly remains under pressure. “Record growth of catastrophe bond issuance and collateralised reinsurance is putting further strain on pricing, especially in relation to US natural catastrophe exposed lines,” Fitch explained. So the four major European reinsurers are clearly all suffering, with three of them looking at combined ratios of near or above 100% on a normalised basis, while the other is still expanding into pressure P&C. This scenario has of course been going on for a while now, with estimates showing that reinsurers are barely making any return on equity these days. But as this persists the risk of reinsurers turning unprofitable under just a slightly above average loss scenario is increasing, while on the other side the reserves may begin to dwindle. That suggests that survival may become a little trickier and the impact of falling to an underwriting loss in a year where loss activity is really not that unexpected could be significant for a major reinsurer, shareholders can tend to make themselves heard when the companies they back suffer under circumstances they would previously have been expected to ride out with ease. The margin for error is getting slimmer and while the pressure continues we’re perhaps nearing a stage where some companies have to shed more of their catastrophe business, providing more opportunities for ILS and collateralised markets to step in. As pressure continues to mount and the margins for error get slimmer, the opportunities for ILS markets to further strengthen their positions in key peak zone catastrophe risks will increase and as a result reinsurers could find they need greater access to third-party capital themselves, to support their own underwriting efforts.